Hearing about the HannoverGEN project made me feel envious and excited. Envious, because I wish my high school had offered the kind of hands-on molecular biology training provided to high school students in Hannover, the capital of the German state of Niedersachsen. Excited, because it reminded me of the joy I felt when I first isolated DNA and ran gels after restriction enzyme digests during my first year of university in Munich. I knew that many of the students at the HannoverGEN high schools would be similarly thrilled by their laboratory experience and perhaps even pursue careers as biologists or biochemists. What did HannoverGEN entail? It was an optional pilot program initiated and funded by the state government of Niedersachsen at four high schools in the Hannover area. Students enrolled in the HannoverGEN classes would learn to use molecular biology tools typically reserved for college-level or graduate school courses in order to study plant genetics. Some of the basic experiments involved isolating DNA from cabbage or how learning how bacteria transfer genes to plants, more advanced experiments enabled the students to analyze whether or not the genome of a provided maize sample had been genetically modified. Each experimental unit was accompanied by relevant theoretical instruction on the molecular mechanisms of gene expression and biotechnology as well as ethical discussions regarding the benefits and risks of generating genetically modified organisms (“GMOs”). The details of the HannoverGEN program are only accessible through the the Wayback Machine Internet archive because the award-winning educational program and the associated website were shut down in 2013 at the behest of German anti-GMO activist groups, environmental activists, Greenpeace, the Niedersachsen Green Party and the German organic food industry. Why did these activists and organic food industry lobbyists oppose a government-funded educational program which improved the molecular biology knowledge and expertise of high school students? A press release entitled “Keine Akzeptanzbeschaffung für Agro-Gentechnik an Schulen!” (“No Acceptance for Agricultural Gene Technology at Schools“) in 2012 by an alliance representing “organic” or “natural food” farmers accompanied by the publication of a critical “study” with the same title (PDF), which was funded by this alliance as well as its anti-GMO partners, gives us some clues. They feared that the high school students might become too accepting of biotechnology in agriculture and that the curriculum did not sufficiently highlight all the potential dangers of GMOs. By allowing the ethical discussions to not only discuss the risks but also mention the benefits of genetically modifying crops, students might walk away with the idea that GMOs could be beneficial for humankind. The group believed that taxpayer money should not be used to foster special interests such as those of the agricultural industry which may want to use GMOs. A response by the University of Hannover (PDF), which had helped develop the curriculum and coordinated the classes for the high school students, carefully analyzed the complaints of the anti-GMO activists. The author of the anti-HannoverGEN “study” had not visited the HannoverGEN laboratories, nor had he had interviewed the biology teachers or students enrolled in the classes. In fact, his critique was based on weblinks that were not even used in the curriculum by the HannoverGEN teachers or students. His analysis ignored the balanced presentation of biotechnology that formed the basis of the HannoverGEN curriculum and that discussing potential risks of genetic modification was a core topic in all the classes. Unfortunately, this shoddily prepared “study” had a significant impact, in part because it was widely promoted by partner organizations. Its release in the autumn of 2012 came at an opportune time for political activists because Niedersachsen was about to have an election. Campaigning against GMOs seemed like a perfect cause for the Green Party and a high school program which taught the use of biotechnology to high school students became a convenient lightning rod. When the Social Democrats and the Green Party formed a coalition after winning the election in early 2013, nixing the HannoverGEN high school program was formally included in the so-called coalition contract. This is a document in which coalition partners outline the key goals for the upcoming four year period. When one considers how many major issues and problems the government of a large German state has to face, such as healthcare, education, unemployment or immigration, it is mind-boggling that de-funding a program involving only four high schools received so much attention that it needed to be anchored in the coalition contract. In fact, it is a testimony to the influence and zeal of the anti-GMO lobby. Once the cancellation of HannoverGEN was announced, the Hannover branch of Greenpeace also took credit for campaigning against this high school program and celebrated its victory. The Greenpeace anti-GMO activist David Petersen said that the program was too cost intensive because equipping high school laboratories with state-of-the-art molecular biology equipment had already cost more than 1 million Euros. The previous center-right government which had initiated the HannoverGEN project was planning on expanding the program to even more high schools because of the program’s success and national recognition for innovative teaching. According to Petersen, this would have wasted even more taxpayer money without adequately conveying the dangers of using GMOs in agriculture. The scientific community was shaken up by the decision of the new Social Democrat-Green Party coalition government in Niedersachsen. This was an attack on the academic freedom of schools under the guise of accusing them of promoting special interests while ignoring that the anti-GMO activists were representing their own special interests. The “study” attacking HannoverGEN was funded by the lucrative “organic” or “natural food” food industry! Scientists and science writers such as Martin Ballaschk or Lars Fischer wrote excellent critical articles stating that squashing high-quality, hand-on science programs could not lead to better decision-making. How could ignorant students have a better grasp of GMO risks and benefits than those who receive relevant formal science education and thus make truly informed decisions? Sadly, this outcry by scientists and science writers did not make much of a difference. It did not seem that the media felt this was much of a cause to fight for. I wonder if the media response would have been just as lackluster if the government had de-funded a hands-on science lab to study the effects of climate change. In 2014, the government of Niedersachsen then announced that they would resurrect an advanced biology laboratory program for high schools with the generic and vague title “Life Science Lab”. By removing the word “Gen” from its title which seems to trigger visceral antipathy among anti-GMO activists, de-emphasizing genome science and by also removing any discussion of GMOs from the curriculum, this new program would leave students in the dark about GMOs. Ignorance is bliss from an anti-GMO activist perspective because the void of scientific ignorance can be filled with fear. From the very first day that I could vote in Germany during the federal election of 1990, I always viewed the Green Party as a party that represented my generation. A party of progressive ideas, concerned about our environment and social causes. However, the HannoverGEN incident is just one example of how the Green Party is caving in to ideologies, thus losing its open-mindedness and progressive nature. In the United States, the anti-science movement, which attacks teaching climate change science or evolutionary biology at schools, tends to be rooted in the right wing political spectrum. Right wingers or libertarians are the ones who always complain about taxpayer dollars being wasted and used to promote agendas in schools and universities. But we should not forget that there is also a different anti-science movement rooted in the leftist and pro-environmental political spectrum – not just in Germany. As a scientist, I feel that it is becoming increasingly difficult to support the Green Party because of its anti-science stance. I worry about all anti-science movements, especially those which attack science education. There is nothing wrong with questioning special interests and ensuring that school and university science curricula are truly balanced. But the balance needs to be rooted in scientific principles, not political ideologies. Science education has a natural bias – it is biased towards knowledge that is backed up by scientific evidence. We can hypothetically discuss dangers of GMOs but the science behind the dangers of GMO crops is very questionable. Just like environmental activists and leftists agree with us scientists that we do not need to give climate change deniers and creationists “balanced” treatment in our science curricula, they should also accept that much of the “anti-GMO science” is currently more based on ideology than on actual scientific data. Our job is to provide excellent science education so that our students can critically analyze and understand scientific research, independent of whether or not it supports our personal ideologies. Anti-Semitism and the holocaust are among the central themes in the modern German secondary school curriculum. During history lessons in middle school, we learned about anti-Semitism and the persecution of Jews in Europe during the middle ages and early modernity. Our history curriculum in the ninth and tenth grades focused on the virulent growth of anti-Semitism in 20th century Europe, how Hitler and the Nazi party used anti-Semitism as a means to rally support and gain power, and how the Nazi apparatus implemented the systematic genocide of millions of Jews. In grades 11 to 13, the educational focus shifts to a discussion of the broader moral and political context of anti-Semitism and Nazism. How could the Nazis enlist the active and passive help of millions of “upstanding” citizens to participate in this devastating genocide? Were all Germans who did not actively resist the Nazis morally culpable or at least morally responsible for the Nazi horrors? Did Germans born after the Second World War inherit some degree of moral responsibility for the crimes committed by the Nazis? How can German society ever redeem itself after being party to the atrocities of the Nazis? Anti-Semitism and Nazism were also important topics in our German literature and art classes because the Nazis persecuted and murdered German Jewish intellectuals and artists, and because the shame and guilt experienced by Germans after 1945 featured so prominently in German art and literature. One purpose of extensively educating Germany school-children about this dark and shameful period of German history is the hope that if they are ever faced with the reemergence of prejudice directed against Jews or any other ethnic or religious group, they will have the courage to stand up for those who are being persecuted and make the right moral choices. As such, it is part of the broader Vergangenheitsbewältigung (wrestling with one’s past) in post-war German society which takes place not only in schools but in various public venues. The good news, according to recent research published in the Proceedings of the National Academy of Sciences by Nico Voigtländer and Hans-Joachim Voth, is that Germans who attended school after the Second World War have shown a steady decline in anti-Semitism. The bad news: Vergangenheitsbewältigung is a bigger challenge for Germans who attended school under the Nazis because a significant proportion of them continue to exhibit high levels of anti-Semitic attitudes more than half a century after the defeat of Nazi Germany. Voigtländer and Voth examined the results of the large General Social Survey for Germany (ALLBUS) in which several thousand Germans were asked about their values and beliefs. The survey took place in 1996 and 2006, and the researchers combined the results of both surveys with a total of 5,300 participants from 264 German towns and cities. The researchers were specifically interested in anti-Semitic attitudes and focused on three survey questions specifically related to anti-Semitism. Survey participants were asked to respond on a scale of 1 to 7 and indicate whether they thought Jews had too much influence in the world, whether Jews were responsible for their own persecution and whether Jews should have equal rights. The researchers categorized participants as “committed anti-Semites” if they revealed anti-Semitic attitudes to all three questions. The overall rate of committed anti-Semites was 4% in Germany but there was significant variation depending on the geographical region and the age of the participants. Germans born in the 1970s and 1980s had only 2%-3% committed anti-Semites whereas the rate was nearly double for Germans born in the 1920s (6%). However, the researchers noted one exception: Germans born in the 1930s. Those citizens had the highest fraction of anti-Semites: 10%. The surveys were conducted in 1996 and 2006 when the participants born in in the 1930s were 60-75 years old. In other words, one out of ten Germans of that generation did not think that Jews deserved equal rights! 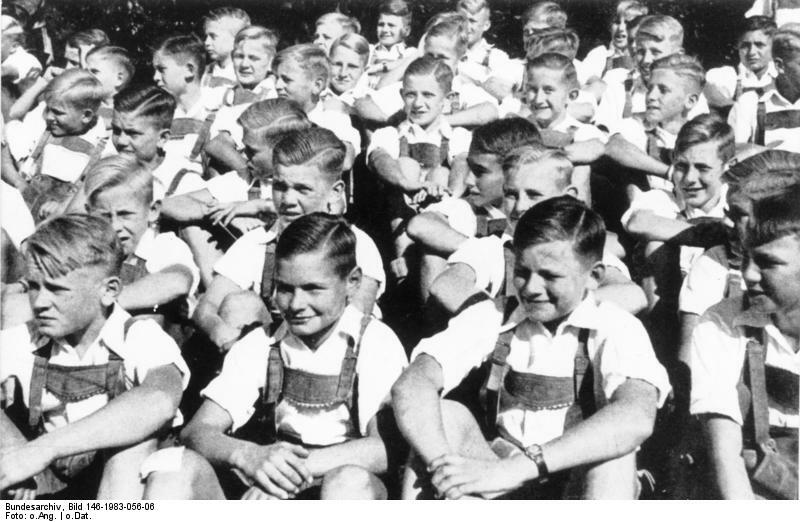 The researchers attributed this to the fact that people born in the 1930s were exposed to the full force of systematic Nazi indoctrination with anti-Semitic views which started as early as in elementary school and also took place during extracurricular activities such as the Hitler Youth programs. The Nazis came to power in 1933 and immediately began implementing a whole-scale propaganda program in all schools. A child born in 1932, for example, would have attended elementary school and middle school as well as Hitler Youth programs from age six onwards till the end of the war in 1945 and become inculcated with anti-Semitic propaganda. The researchers then address the puzzling low levels of anti-Semitic prejudices among Germans born in the 1920s. If the theory of the researcher were correct that anti-Semitic prejudices persist today because Nazi school indoctrination then why aren’t Germans born in the 1920s more anti-Semitic? A child born in 1925 would have been exposed to Nazi propaganda throughout secondary school. Oddly enough, women born in the 1920s did show high levels of anti-Semitism when surveyed in 1996 and 2006 but men did not. Voigtländer and Voth solve this mystery by reviewing wartime fatality rates. The most zealous male Nazi supporters with strong anti-Semitic prejudices were more likely to volunteer for the Waffen-SS, the military wing of the Nazi party. Some SS divisions had an average age of 18 and these SS-divisions had some of the highest fatality rates. This means that German men born in the 1920s weren’t somehow immune to Nazi propaganda. Instead, most of them perished because they bought into it and this is why we now see lower levels of anti-Semitism than expected in Germans born during that decade. A major limitation of this study is its correlational nature and the lack of data on individual exposure to Nazism. The researchers base their conclusions on birth years and historical votes for anti-Semitic parties of towns but did not track how much individuals were exposed to anti-Semitic propaganda in their schools or their families. Such a correlational study cannot establish a cause-effect relationship between propaganda and the persistence of prejudice today. One factor not considered by the researchers, for example, is that Germans born in the 1930s are also among those who grew up as children in post-war Germany, often under conditions of extreme poverty and even starvation. Even without being able to establish a clear cause-effect relationship, the findings of the study raise important questions about the long-term effects of racial propaganda. It appears that a decade of indoctrination may give rise to a lifetime of hatred. Our world continues to be plagued by prejudice against fellow humans based on their race or ethnicity, religion, political views, gender or sexual orientation. Children today are not subject to the systematic indoctrination implemented by the Nazis but they are probably still exposed to more subtle forms of prejudice and we do not know much about its long-term effects. We need to recognize the important role of public education in shaping the moral character of individuals and ensure that our schools help our children become critical thinkers with intact moral reasoning, citizens who can resist indoctrination and prejudice. Murder your darlings. The British writer Sir Arthur Quiller Crouch shared this piece of writerly wisdom when he gave his inaugural lecture series at Cambridge, asking writers to consider deleting words, phrases or even paragraphs that are especially dear to them. The minute writers fall in love with what they write, they are bound to lose their objectivity and may not be able to judge how their choice of words will be perceived by the reader. But writers aren’t the only ones who can fall prey to the Pygmalion syndrome. Scientists often find themselves in a similar situation when they develop “pet” or “darling” hypotheses. How do scientists decide when it is time to murder their darling hypotheses? The simple answer is that scientists ought to give up scientific hypotheses once the experimental data is unable to support them, no matter how “darling” they are. However, the problem with scientific hypotheses is that they aren’t just generated based on subjective whims. A scientific hypothesis is usually put forward after analyzing substantial amounts of experimental data. The better a hypothesis is at explaining the existing data, the more “darling” it becomes. Therefore, scientists are reluctant to discard a hypothesis because of just one piece of experimental data that contradicts it. In addition to experimental data, a number of additional factors can also play a major role in determining whether scientists will either discard or uphold their darling scientific hypotheses. Some scientific careers are built on specific scientific hypotheses which set apart certain scientists from competing rival groups. 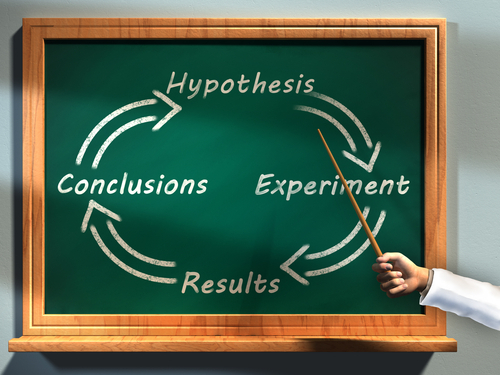 Research grants, which are essential to the survival of a scientific laboratory by providing salary funds for the senior researchers as well as the junior trainees and research staff, are written in a hypothesis-focused manner, outlining experiments that will lead to the acceptance or rejection of selected scientific hypotheses. Well written research grants always consider the possibility that the core hypothesis may be rejected based on the future experimental data. But if the hypothesis has to be rejected then the scientist has to explain the discrepancies between the preferred hypothesis that is now falling in disrepute and all the preliminary data that had led her to formulate the initial hypothesis. Such discrepancies could endanger the renewal of the grant funding and the future of the laboratory. Last but not least, it is very difficult to publish a scholarly paper describing a rejected scientific hypothesis without providing an in-depth mechanistic explanation for why the hypothesis was wrong and proposing alternate hypotheses. For example, it is quite reasonable for a cell biologist to formulate the hypothesis that protein A improves the survival of neurons by activating pathway X based on prior scientific studies which have shown that protein A is an activator of pathway X in neurons and other studies which prove that pathway X improves cell survival in skin cells. If the data supports the hypothesis, publishing this result is fairly straightforward because it conforms to the general expectations. However, if the data does not support this hypothesis then the scientist has to explain why. Is it because protein A did not activate pathway X in her experiments? Is it because in pathway X functions differently in neurons than in skin cells? Is it because neurons and skin cells have a different threshold for survival? Experimental results that do not conform to the predictions have the potential to uncover exciting new scientific mechanisms but chasing down these alternate explanations requires a lot of time and resources which are becoming increasingly scarce. Therefore, it shouldn’t come as a surprise that some scientists may consciously or subconsciously ignore selected pieces of experimental data which contradict their darling hypotheses. Let us move from these hypothetical situations to the real world of laboratories. There is surprisingly little data on how and when scientists reject hypotheses, but John Fugelsang and Kevin Dunbar at Dartmouth conducted a rather unique study “Theory and data interactions of the scientific mind: Evidence from the molecular and the cognitive laboratory” in 2004 in which they researched researchers. They sat in at scientific laboratory meetings of three renowned molecular biology laboratories at carefully recorded how scientists presented their laboratory data and how they would handle results which contradicted their predictions based on their hypotheses and models. In their final analysis, Fugelsang and Dunbar included 417 scientific results that were presented at the meetings of which roughly half (223 out of 417) were not consistent with the predictions. Only 12% of these inconsistencies lead to change of the scientific model (and thus a revision of hypotheses). In the vast majority of the cases, the laboratories decided to follow up the studies by repeating and modifying the experimental protocols, thinking that the fault did not lie with the hypotheses but instead with the manner how the experiment was conducted. In the follow up experiments, 84 of the inconsistent findings could be replicated and this in turn resulted in a gradual modification of the underlying models and hypotheses in the majority of the cases. However, even when the inconsistent results were replicated, only 61% of the models were revised which means that 39% of the cases did not lead to any significant changes. The study did not provide much information on the long-term fate of the hypotheses and models and we obviously cannot generalize the results of three molecular biology laboratory meetings at one university to the whole scientific enterprise. Also, Fugelsang and Dunbar’s study did not have a large enough sample size to clearly identify the reasons why some scientists were willing to revise their models and others weren’t. Was it because of varying complexity of experiments and models? Was it because of the approach of the individuals who conducted the experiments or the laboratory heads? I wish there were more studies like this because it would help us understand the scientific process better and maybe improve the quality of scientific research if we learned how different scientists handle inconsistent results. In my own experience, I have also struggled with results which defied my scientific hypotheses. In 2002, we found that stem cells in human fat tissue could help grow new blood vessels. Yes, you could obtain fat from a liposuction performed by a plastic surgeon and inject these fat-derived stem cells into animal models of low blood flow in the legs. Within a week or two, the injected cells helped restore the blood flow to near normal levels! The simplest hypothesis was that the stem cells converted into endothelial cells, the cell type which forms the lining of blood vessels. However, after several months of experiments, I found no consistent evidence of fat-derived stem cells transforming into endothelial cells. We ended up publishing a paper which proposed an alternative explanation that the stem cells were releasing growth factors that helped grow blood vessels. But this explanation was not as satisfying as I had hoped. It did not account for the fact that the stem cells had aligned themselves alongside blood vessel structures and behaved like blood vessel cells. Even though I “murdered” my darling hypothesis of fat –derived stem cells converting into blood vessel endothelial cells at the time, I did not “bury” the hypothesis. It kept ruminating in the back of my mind until roughly one decade later when we were again studying how stem cells were improving blood vessel growth. The difference was that this time, I had access to a live-imaging confocal laser microscope which allowed us to take images of cells labeled with red and green fluorescent dyes over long periods of time. Below, you can see a video of human bone marrow mesenchymal stem cells (labeled green) and human endothelial cells (labeled red) observed with the microscope overnight. The short movie compresses images obtained throughout the night and shows that the stem cells indeed do not convert into endothelial cells. Instead, they form a scaffold and guide the endothelial cells (red) by allowing them to move alongside the green scaffold and thus construct their network. This work was published in 2013 in the Journal of Molecular and Cellular Cardiology, roughly a decade after I had been forced to give up on the initial hypothesis. Back in 2002, I had assumed that the stem cells were turning into blood vessel endothelial cells because they aligned themselves in blood vessel like structures. I had never considered the possibility that they were scaffold for the endothelial cells. This and other similar experiences have lead me to reformulate the “murder your darlings” commandment to “murder your darling hypotheses but do not bury them”. Instead of repeatedly trying to defend scientific hypotheses that cannot be supported by emerging experimental data, it is better to give up on them. But this does not mean that we should forget and bury those initial hypotheses. With newer technologies, resources or collaborations, we may find ways to explain inconsistent results years later that were not previously available to us. This is why I regularly peruse my cemetery of dead hypotheses on my hard drive to see if there are ways of perhaps resurrecting them, not in their original form but in a modification that I am now able to test. Note: An earlier version of this article first appeared on 3Quarksdaily. Fareed Zakaria recently wrote an article in the Washington Post lamenting the loss of liberal arts education in the United States. However, instead of making a case for balanced education, which integrates various forms of creativity and critical thinking promoted by STEM (science, technology, engineering and mathematics) and by a liberal arts education, Zakaria misrepresents STEM education as primarily teaching technical skills and also throws in a few cliches about Asians. You can read my response to his article at 3Quarksdaily. Research institutions in the life sciences engage in two types of regular scientific meet-ups: scientific seminars and lab meetings. The structure of scientific seminars is fairly standard. Speakers give Powerpoint presentations (typically 45 to 55 minutes long) which provide the necessary scientific background, summarize their group’s recent published scientific work and then (hopefully) present newer, unpublished data. Lab meetings are a rather different affair. The purpose of a lab meeting is to share the scientific work-in-progress with one’s peers within a research group and also to update the laboratory heads. Lab meetings are usually less formal than seminars, and all members of a research group are encouraged to critique the presented scientific data and work-in-progress. There is no need to provide much background information because the audience of peers is already well-acquainted with the subject and it is not uncommon to show raw, unprocessed data and images in order to solicit constructive criticism and guidance from lab members and mentors on how to interpret the data. This enables peer review in real-time, so that, hopefully, major errors and flaws can be averted and newer ideas incorporated into the ongoing experiments. During the past two decades that I have actively participated in biological, psychological and medical research, I have observed very different styles of lab meetings. Some involve brief 5-10 minute updates from each group member; others develop a rotation system in which one lab member has to present the progress of their ongoing work in a seminar-like, polished format with publication-quality images. Some labs have two hour meetings twice a week, other labs meet only every two weeks for an hour. Some groups bring snacks or coffee to lab meetings, others spend a lot of time discussing logistics such as obtaining and sharing biological reagents or establishing timelines for submitting manuscripts and grants. During the first decade of my work as a researcher, I was a trainee and followed the format of whatever group I belonged to. During the past decade, I have been heading my own research group and it has become my responsibility to structure our lab meetings. I do not know which format works best, so I approach lab meetings like our experiments. Developing a good lab meeting structure is a work-in-progress which requires continuous exploration and testing of new approaches. During the current academic year, I decided to try out a new twist: incorporating literature and philosophy into the weekly lab meetings. My research group studies stem cells and tissue engineering, cellular metabolism in cancer cells and stem cells and the inflammation of blood vessels. Most of our work focuses on identifying molecular and cellular pathways in cells, and we then test our findings in animal models. Over the years, I have noticed that the increasing complexity of the molecular and cellular signaling pathways and the technologies we employ makes it easy to forget the “big picture” of why we are even conducting the experiments. Determining whether protein A is required for phenomenon X and whether protein B is a necessary co-activator which acts in concert with protein A becomes such a central focus of our work that we may not always remember what it is that compels us to study phenomenon X in the first place. Some of our research has direct medical relevance, but at other times we primarily want to unravel the awe-inspiring complexity of cellular processes. But the question of whether our work is establishing a definitive cause-effect relationship or whether we are uncovering yet another mechanism within an intricate web of causes and effects sometimes falls by the wayside. When asked to explain the purpose or goals of our research, we have become so used to directing a laser pointer onto a slide of a cellular model that it becomes challenging to explain the nature of our work without visual aids. This fall, I introduced a new component into our weekly lab meetings. After our usual round-up of new experimental data and progress, I suggested that each week one lab member should give a brief 15 minute overview about a book they had recently finished or were still reading. The overview was meant to be a “teaser” without spoilers, explaining why they had started reading the book, what they liked about it, and whether they would recommend it to others. One major condition was to speak about the book without any Powerpoint slides! But there weren’t any major restrictions when it came to the book; it could be fiction or non-fiction and published in any language of the world (but ideally also available in an English translation). If lab members were interested and wanted to talk more about the book, then we would continue to discuss it, otherwise we would disband and return to our usual work. If nobody in my lab wanted to talk about a book then I would give an impromptu mini-talk (without Powerpoint) about a topic relating to the philosophy or culture of science. I use the term “culture of science” broadly to encompass topics such as the peer review process and post-publication peer review, the question of reproducibility of scientific findings, retractions of scientific papers, science communication and science policy – topics which have not been traditionally considered philosophy of science issues but still relate to the process of scientific discovery and the dissemination of scientific findings. One member of our group introduced us to “For Whom the Bell Tolls” by Ernest Hemingway. He had also recently lived in Spain as a postdoctoral research fellow and shared some of his own personal experiences about how his Spanish friends and colleagues talked about the Spanish Civil War. At another lab meeting, we heard about “Sycamore Row” by John Grisham and the ensuring discussion revolved around race relations in Mississippi. I spoke about “A Tale for a Time Being” by Ruth Ozeki and the difficulties that the book’s protagonist faced as an outsider when her family returned to Japan after living in Silicon Valley. I think that the book which got nearly everyone in the group talking was “Far From the Tree: Parents, Children and the Search for Identity” by Andrew Solomon. The book describes how families grapple with profound physical or cognitive differences between parents and children. The PhD student who discussed the book focused on the “Deafness” chapter of this nearly 1000-page tome but she also placed it in the broader context of parenting, love and the stigma of disability. We stayed in the conference room long after the planned 15 minutes, talking about being “disabled” or being “differently abled” and the challenges that parents and children face. On the weeks where nobody had a book they wanted to present, we used the time to touch on the cultural and philosophical aspects of science such as Thomas Kuhn’s concept of paradigm shifts in “The Structure of Scientific Revolutions“, Karl Popper’s principles of falsifiability of scientific statements, the challenge of reproducibility of scientific results in stem cell biology and cancer research, or the emergence of Pubpeer as a post-publication peer review website. Some of the lab members had heard of Thomas Kuhn’s or Karl Popper’s ideas before, but by coupling it to a lab meeting, we were able to illustrate these ideas using our own work. A lot of 20th century philosophy of science arose from ideas rooted in physics. When undergraduate or graduate students take courses on philosophy of science, it isn’t always easy for them to apply these abstract principles to their own lab work, especially if they pursue a research career in the life sciences. Thomas Kuhn saw Newtonian and Einsteinian theories as distinct paradigms, but what constitutes a paradigm shift in stem cell biology? Is the ability to generate induced pluripotent stem cells from mature adult cells a paradigm shift or “just” a technological advance? It is difficult for me to know whether the members of my research group enjoy or benefit from these humanities blurbs at the end of our lab meetings. Perhaps they are just tolerating them as eccentricities of the management and maybe they will tire of them. I personally find these sessions valuable because I believe they help ground us in reality. They remind us that it is important to think and read outside of the box. As scientists, we all read numerous scientific articles every week just to stay up-to-date in our area(s) of expertise, but that does not exempt us from also thinking and reading about important issues facing society and the world we live in. I do not know whether discussing literature and philosophy makes us better scientists but I hope that it makes us better people. The professional animator and molecular biologist Janet Iwasa at Harvard Medical School is generating beautiful animations of cellular processes such as proteasome structure and function or endocytosis. Importantly, she has published these on her website with a Creative Commons license so that everyone has access to them. She has been interviewed by EarthSky, where she explains why she became a molecular animator. There are plenty of other beautiful animations and illustrations on her website and I highly recommend that anyone with an interest in cell biology should explore those. When I remember the 80s, I think of Nena’s 99 Luftballons, Duran Duran’s Wild Boys and ….snake venom. Back in those days, I used to be a typical high school science nerd. My science nerdiness interfered with my ability to socialize with non-nerds and it was characterized by an unnecessary desire to read science books and articles that I did not really understand, just so that I could show off with some fancy science terminology. I did not have much of an audience to impress, because my class-mates usually ignored me. My high school biology teacher, Herr Sperr, was the only one who had the patience to listen to me. One of the science books that I purchased was called “Gehirn und Nervensystem” (i.e. “Brain and Nervous System”), published by Spektrum der Wissenschaft, the German publisher of Scientific American. It was a collection of Scientific American articles in the field of neuroscience that had been translated into German. I was thumbing through it, looking for some new neurobiology idea or expression that I could use to impress Herr Sperr. While browsing the book, I came across the article “Der Nervenwachstumsfaktor” (originally published in Scientific American as “The Nerve-Growth Factor” in 1979) by Rita Levi-Montalcini and Pietro Calissano. Levi-Montalcini and Calissano started off by describing the state of knowledge and the unanswered questions in the field of developmental neurobiology and neuronal differentiation in the 1940s, when Levi-Montalcini was about to launch her career as a scientist. They commented on how the simple yet brilliant idea to test whether tumors could influence the growth of nerves sparked a whole new field of investigation. They narrated a beautiful story of scientific discovery, from postulating a “nerve growth factor” to actually isolating and sequencing it. Despite all the advances that Levi-Montalcini and her colleagues had made, the article ended with a new mystery, that the role of the nerve growth factor may be much bigger than all the researchers suspected. The nerve growth factor was able to act on cells that were not neurons and it was unclear why this was the case. By hinting at these yet to be defined roles, the article made it clear that so much more work was necessary and I felt that an invitation was being extended to the readers to participate in the future discovery. The article mentioned one important coincidence that helped shape the progress of discovering the sequence of the nerve growth factor. To assess whether the putative nerve growth factor contained nucleic acids, Levi-Montalcini and her colleagues exposed the “soup” that was inducing the growth of nerves to snake venom. The rationale was that snake venom (by the way, the German expression “Schlangengift” sounds even more impressive than the English “snake venom”) would degrade nucleic acids and if the growth enhancing properties disappeared, it would mean that the nerve growth inducing factor contained nucleic acids. It turned out that the snake venom unexpectedly magnified the nerve growth enhancing effects, because the venom contained large quantities of the nerve growth factor itself. This unexpected finding made it much easier for the researchers to sequence the nerve growth factor, because the snake venom now provided access to a large source of the nerve growth factor and it resulted in a new mystery: Why would snake venom contain a nerve growth factor? In the subsequent decades, as I embarked on my own career as a scientist, I often thought about this article that I read back in high school. It inspired me to become a cell biologist and many of the projects in my laboratory today focus on the effects of growth factors on blood vessels and stem cells. The article also made me think about the importance of continuously re-evaluating the tools that we use. Sometimes our tools are not as neutral or straight-forward as we think, and this lesson is just as valid today as it was half a century ago. For example, a recent paper in Cell found that the virus used for reprogramming adult cells into stem cells is not merely a tool that allows entry of the reprogramming factors, as was previously thought. The virus tool can actually activate the stem cell reprogramming itself, reminiscent of how the “snake venom” tool was able to induce nerve growth. Rita Levi-Montalcini was one of the world’s greatest biologists and passed away on December 30, 2012. In addition to her outstanding scientific work, she was also a shining example of an activist scientist with a conscience, who fought for education and research. I never had the opportunity to meet her in person, but I was inspired by her work and I will always see her as a role model.